Sashi is a strong confident malinois training for dual purpose work. She was raised for 1 year with Bite Ranch K9 in Huntsville, Al. She will be with us to complete here training. We can’t wait to see where her training takes us. We have added another strong female to our pack. She is a Kludde x Thorn puppy. We are beginning her training in foundational bite work, tracking, and marker training! We are extremely excited to bring this fantastic blood line to Homefront Canine. A 12 week old Quinto x Quilla puppy that is already showing over the top drives. Continue to follow us to keep up with his training as we plan to start him in protection, tracking, and scent work! Gypsy received her tracking certification today! Months of preparation (and waiting out winter). Such a strong working dog with a great nose! What a dedicated and hardworking team! We are so proud of both, congratulations! A Caro van Branddevoort daughter, with very high drives and great intensity. She is training for personal protection currently and will be a breeding female in our program. Her first breeding will be with Abor vom Pawkes, a Lubek son. 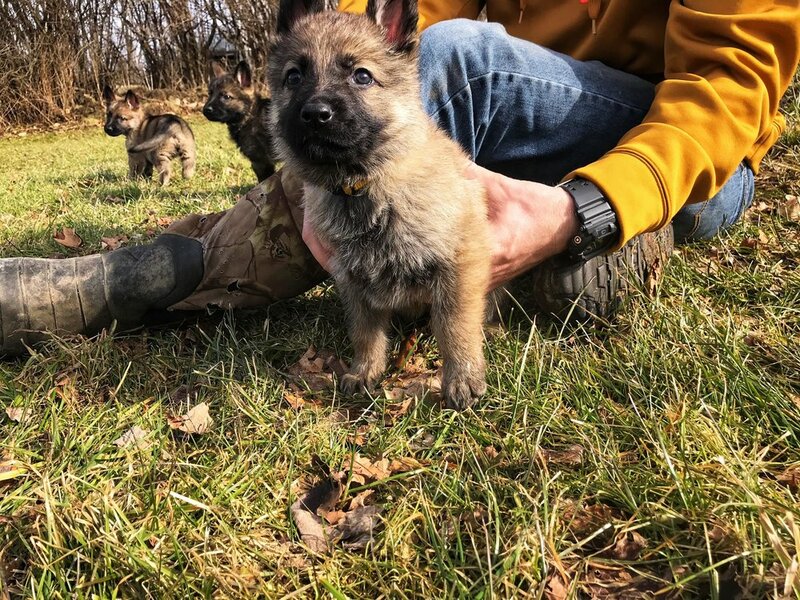 Our puppies are 6 week and enjoying the little bit of nice weather we have! They have begun our obstacle course, in order to build their nerves and confidence. This litter is a very strong and confident bunch! Check out our beautiful females! We have a confirmation that our female, Viven z Herodesova Domu, who was bred with Athos Sturmfalken, is pregnant! Puppies will be ready in March! 7 Puppies have arrived from our Vivien x Kliff litter! 1 Male, 2 females left! These are HIGH drive working dogs and will not be sold to pet homes. We have a confirmed pregnancy between Vivien Z Herodesova [ZVV1] and Kliff vom Floyd Haus [IPO3]. Litter is due early July. We are currently accepting deposits! Check out our 'Litters' page for pedigrees and more information! We are excited to announce a new addition to our team, Lorockmor Wangari BRN 27967. She is a Big Roy daughter (2013 KNPV Champion) and Berry II granddaughter (2010 KNPV Champion). We have begun her training for French Ring- Follow our social media pages to watch her progress! Check out her pedigree! Puppies are 3 weeks old today! We still have 1 female available. Beautifull dark sable with distinct markings around her eyes, ears, and legs! Check out out current litter for more pictures and pedigree of parents! We have a confirmed pregnancy between Page vom Haus Salztalblick [IPO1] and Kliff vom Floyd Haus [IPO3]. Litter is due early February. We are currently accepting deposits! Check out our 'Litters' page for pedigrees and more information! Today we had the privilege of participating in Disability Mentoring Day coordinated by the Cortland Area Taskforce to Increase Disability Employment (TIDE) Group. The girls learned a lot about training, owning a business and even were able to ask a police K9 handler some questions. Such a great experience to be a part of something that may seem insignificant to some, but the "best day ever" to these girls! Puppies are 5 weeks old and are started on rag work! They will be introduced to an obstacle course this week for environmental work. We are currently accepting deposits for the last female and male of the litter! Contact today for more information! We have our LAST SUMMER Canine 101 class beginning July 6th @ 6PM. If you are interested in signing up, please read over the class information and register here. Canine 201 will begin May 27th, time/location is TBA. This class will be outside with make up rain days. Please sign up under Canine 201! Our Page x Kliff litter has arrived! We have 1 female still available. These dogs will have high drives and will not be sold to pet homes. Congratulations to our very own Rush vom Kraftwerk and Nathan Moran for passing their police certification today! Rush came to Homefront Canine at 6 weeks of age. He started training to become a personal protection dog, but transitioned to a police K9 after seeing his potential!